This elegant, restored 1885 townhouse-style one bedroom condominium is perched perfectly in the epicenter of charming and historic landmarked Carnegie Hill District, moments from Central Park and the Guggenheim Museum. Three flights of stairs lead you up to this enchanting home with east-facing views from your living room bathed in morning sunlight overlooking the treed townhouse gardens of 91st street. A dining area right off your kitchen affords you ample space for dining and entertaining. The well-proportioned bedroom faces west over the treetops of Madison Avenue with lovely afternoon sunlight and the core of the apartment is anchored by the kitchen and recently renovated bathroom. 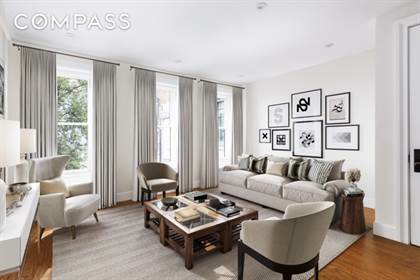 This apartment is financially connected to an abutting eight-story condominium (47 East 91st Street) that provides a full-time concierge/24-hour doorman to accept packages, and handyman services. Nothing beats this refined and convenient location, just one block away from Central Park, the Cooper Hewitt Museum, The Jewish Museum, Reservoir and every imaginable convenience and amenity from superb restaurants, retail and transportation to entertainment and outstanding educational institutions. A perfect home or pied-a-terre in a super-desirable part of town, close to all transportation with easy access to the airports too. Images are virtually staged. Hi, I'd like to find out more information about 1281 Madison Avenue. Thanks so much!